Once a friendly ghost, CASPER is now the methodology that could completely transform the everyday effectiveness of your workforce. CASPER can give your teams the confidence to tackle any issue that the business throws at them with clarity and confidence. CASPER will ensure that your teams are thinking and executing flawlessly. CASPER can change whole organisational cultures for the better. But more on CASPER later…. Issue resolution is your ability to cope with the problems that need to be solved, the decisions that need to be made, and the risks that need to be mitigated. It is your ability to think through these issues, and consistently take effective action to resolve them. It means that when a problem occurs, you are quickly able to establish and eradicate the root cause. It means that when a decision needs to be made, you are able to rationally select the best alternative. It means that when risks loom, you are able to identify, prioritise and mitigate them. Resolving issues allows you to quickly recover from a quality incident or production breakdown. It allows you to make good commercial and operational choices. It enables you to avoid costly potential problems. Resolving issues is important. Organisational Issue Resolution Capability, is the ability of your workforce to consistently do these things to a high standard. It is an engineered capability that doesn’t just rely on having “good people”. It is about having good people with a good process. In order to be effective in Issue Resolution you need to be good at thinking and doing. We’ve seen organisations that are quite good at getting things done, but 9 times out of 10, what they are doing is completely useless. For example, to try and resolve a quality problem they have made a dozen changes to a production line. However none of those actions have had any impact on the problem at all, as they didn’t address the root cause. They have been a waste of people’s time, and a waste of money. The organisation is missing a good thinking process. We’ve seen other organisations that are actually pretty good at thinking. Often they’ve already made some investment in this capability, and their ability to find the root cause or make a decision is relatively sound. They fail because they are poor at execution. They’re just not very good at creating an action plan and holding each other accountable to deliver on it. The action plan falls behind and as soon as another crisis emerges, the whole thing is forgotten about. A few weeks later the same team is back in the room discussing the same issue. The organisation is missing a good doing process. We’ve seen good techniques for thinking. We’ve seen good techniques for doing. CASPER takes care of both. CASPER stands for Clarify-Analyse-Select-Plan-Execute-Review. It is our framework for outstanding issue resolution and it can transform the performance of organisations. The table below shows how it can be used to think through and execute any kind of issue. The structure is the same for all issues; Clarify it, Analyse it, Select the course of action, Plan it, Execute on it, and Review its success. So simple, so powerful. The original pioneers in the area of good thinking were Kepner & Tregoe. Their book, “The New Rational Manager” was first published over 30 years ago but is still a great read that we highly recommend. The key to good thinking is to have a clear, powerful process for each type of issue, and to make your thinking visible. Visible thinking enables data and information to be introduced into the thinking process from a variety of sources, and in a clear, structured way. A powerful, visible thinking process makes teams effective. Good doing is often taken for granted. It is assumed that having done the right thinking, the execution will naturally follow. Our experience is that this assumption is often flawed. We see many organisations that fail to deliver on the basics of time management, accountability and review. As well as ensuring that your teams are demonstrating good thinking, the CASPER process drives accountability into the business. Accountable teams, thinking clearly, execute brilliantly. Only the CASPER process brings these aspects of good thinking and good doing together. How can we embed CASPER into our culture? As the framework for systematically and proactively driving risk out of the business to reduce quality problems and engineering breakdowns. Determining which existing or new business processes you want to integrate CASPER into is a key pre-requisite to making it a part of your culture. By integrating it into a process, you create triggers for use which help to overcome the initial pain of change. It doesn’t have to be a big bang, in fact piloting its use in a smaller area is often a better way to start. But pick an area where delivering some great results will have a big business impact. If done well, the results delivered from a pilot become the motivation for the rest of the organisation to want to follow suit. Practitioner – A practitioner will have received the basic training. They will be capable of using the CASPER method on their own issues and working within a larger team. Process Leader – The process leader takes accountability for getting the business result. They are an expert in the CASPER process, and will provide guidance to both Practitioners and Coach-Facilitators. They will project manage the roll out, ensure that leaders and middle managers support and understand it, and continually push it towards achieving the business goal. For those organisations serious about developing this capability it will often be a full time role. The process leader will be responsible for ensuring that everyone involved in applying the CASPER process is encouraged to do so. They will ensure that expectations and triggers are clear, that the Coach-Facilitators are supporting the change through effective feedback, and that line-managers and leaders are reinforcing its use. This may also require changes to an individual’s performance management objectives. The process leader brings it all together. When CASPER is embedded into a business culture the results can be astounding. Problems get resolved quicker, decisions are carefully thought through and executed, whilst the driving down of risk makes your production processes safe, reliable and speedy. Teams think clearly and use good quality data and information to act. They also plan effectively, and hold each other accountable for delivery. CASPER can help you to make a breakthrough in business performance. 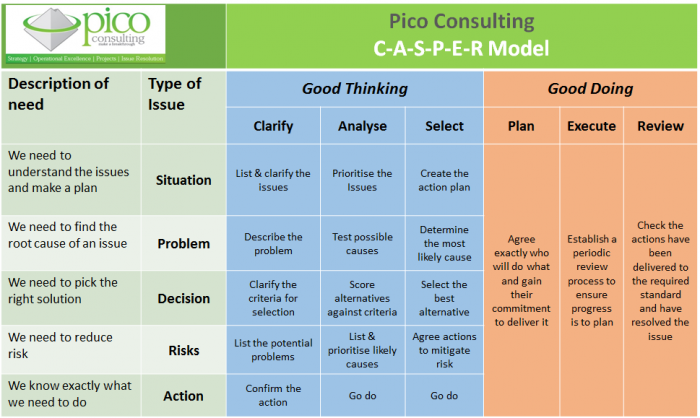 Why not contact us to find out more about how we can embed the CASPER model into your business to drive true Organisational Issue Resolution Capability. Got a major problem or issue that needs resolving quickly? Contact us to see whether an expert facilitation of your issue could help. Enjoyed the article? Tell us about it – we love to receive feedback!